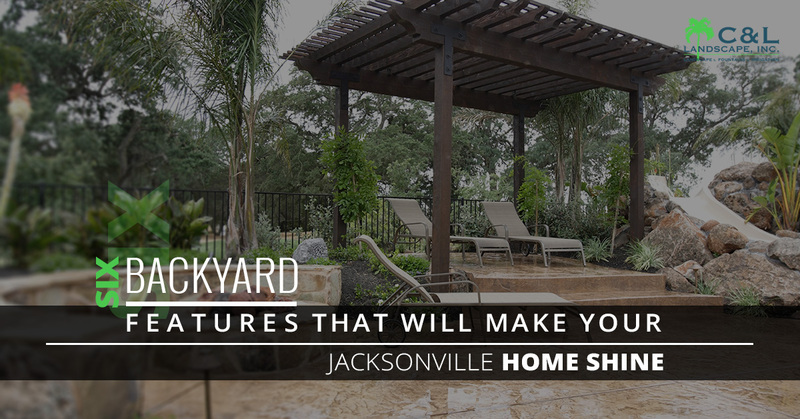 Backyard Ideas Jacksonville: Give Your Backyard A Facelift With These Six Amazing Features! Summer is about to kick off, and that means backyard fun! If you’ve always wanted your yard to be the hot spot of the neighborhood, you might need more than green grass and an old grill. C & L Landscape is a full-service company that specializes in everything from irrigation to construction. A Pergola: A pergola is a great way to offer your guests some shade to escape the Florida heat. C & L Landscape is a certified building contractor, so you know your pergola will be safe and sturdy. Consider growing vines up your pergola for a romantic look, or hang strings of lights along the beams to liven up the nightlife. Brick Pavers: Having a pergola is great, but if you don’t have a sturdy surface to sit on underneath it, then it won’t be the hangout spot you imagined it would be. Our team will help you pick the best brick pavers for your style, and create a perfectly crafted patio and walkway to set up some outdoor furniture on. Outdoor Fireplace: As summer approaches, it’s hard to imagine we’ll be back in winter weather before you know it. Having an outdoor fireplace creates a welcoming ambiance for your guests, and will make a great centerpiece to your already stellar yard. Plus, the kids will love roasting marshmallows all summer long! A Working Irrigation System: Do your sprinklers work? Many people avoid sprinkler repairs and settle for standing outside with a hose for twenty minutes to hand-water the grass. This may be a temporary solution, but a working sprinkler system is worth the investment. Kids will love running through the sprinklers on a hot summer day, and you’ll never have to worry about having dry or dead grass when the guests arrive. Screened Patio: Florida’s humid weather attracts bugs and mosquitos during the hot summer months. Giving guests a place to escape the buzz during a barbecue can make all the difference. Screened patios also make great play spaces for kids where they can get fresh air without getting sun burnt! Outdoor Kitchen: No Jacksonville backyard is complete without a grill. But why stop there? If you’re a barbecue enthusiast, consider having us build a beautiful outdoor kitchen, complete with countertops and sinks. Gone are the days of having to lug raw meat and woodblock cutting boards between the backyard and the kitchen. Take the hassle out of barbecuing with a functional outdoor kitchen – the perfect feature to go under your new pergola! And outdoor kitchens don’t have to be just for guests. Cook outside all summer long while you watch the kids play in the yard or pool! C & L Landscape is a certified general contractor with the knowledge and know-how to turn your boring backyard into a dream feature. We are a family owned and operated company with over thirty years of experience in landscaping and building, and know what works best in our unique Florida climate. Whether you are just looking to revamp your landscaping with local trees and shrubbery, or you want a complete backyard facelift, we can provide the service you need.